Registration Open and Call for Abstracts! It’s back! The Oregon Lakes Association (OLA) and the Washington Lake Protection Association (WALPA) are once again collaborating to organize a Joint OLA/WALPA Lakes Conference. The conference will be held September 26-28, 2018 at the DoubleTree by Hilton in Portland, so put it on your calendar now! Our last joint conference in 2013 — in Vancouver, Washington — was a great success, so the Boards of both organizations enthusiastically agreed to make this collaboration a regular thing. A joint conference allows us to share ideas across borders, form new partnerships, and brainstorm collaborative initiatives and joint research projects. 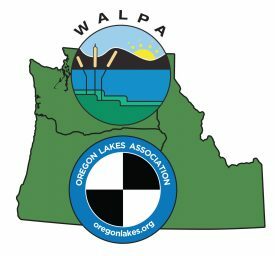 Since WALPA includes both Washington and Idaho, this conference is really THE regional lakes conference for the Pacific Northwest! Activities will conclude with an optional boat tour of Ross Island Lagoon. If you’d like to submit an oral or poster presentation on these or other lake related subjects, find out more and submit you abstract here before August 1st. Conference registration rates range from $25 to $175 depending on membership status and whether you register before the early registration cut-off data of September 1st, not including optional workshops or field trip. Special accommodation rates at the DoubleTree by Hilton are available under the OLA/WALPA Conference group room block though August 28th or until the group block is sold out. Tax deductible cash donations dedicated to the OLA Scholarship fund or WALPA funds. Raffle or auction item donations with proceeds dedicated to the OLA scholarship and WALPA funds. For donating items or services your products or services will be prominently displayed and tax write-off documentation will be provided. Contact Steve Wille (OLA) at 503-880-4453 or Jim Gawel (WALPA) at 253-692-5815 for more information about donating your items or service, download our donation brochure, or fill out this raffle item donation form. Corporate Sponsorship for the conference. With sponsorship you will receive a booth at the conference, advertising through OLA’s Lake Wise and WALPA’s WaterLine newsletters, and conference registration fees for an attendee. Contact Theo Dreher for more information about Corporate Sponsorship. This workshop will cover aquatic weed identification, ecology, and management. Speakers will talk about the interaction between the aquatic environment and aquatic plant growth, the differences between native and nonnative aquatic plants, and the various methods used to manage invasive aquatic plants. Live specimens will be available to aid in the identification of common native and nonnative species. Hands-on microscopic identification of bloom-forming freshwater cyanobacteria using an interactive key. Discussion can cover cyanobacterial toxicology, ecology and genomics, according to participant interests and as time allows. Computer simulations of lakes, reservoirs, rivers, and their watersheds can add much to the traditional toolbox of the lake scientist or lake manager. These simulations, usually called “models”, leverage hard-earned field data to A) interpolate temporally and spatially, B) understand influences on key water quality variables, and C) evaluate management scenarios that are difficult or undesirable to test at the lake itself. Modeling begins with a simulation of the volume of water in a lake and the circulation of that water. Then, abiotic variables like temperature and suspended sediment can be added to a model, followed by nutrients, dissolved oxygen, algae and zooplankton, and other water quality and ecosystem variables of interest. How can you start a modeling effort at your lake? What data sets will you need, and how much time does it take? What types of modeling software do lake managers use, and how do you decide which is right for you? How do lake models differ from watershed models? Why create a model when you could just collect more field data? These questions and more will be addressed in an interactive (i.e., audience participation is required, so come with your site-specific management stories and problems!) workshop run by a modeling group that has solved a wide range of water quality problems. This workshop is meant to connect lake managers and scientists to this powerful technology for the first time. WALPA and OLA seek donations for a raffle/auction to support student research scholarships. If you are interested in donating an item or helping acquire donations, please contact WALPA President Rachael Gravon by email rachael.gravon@kingcounty.gov. Want to Be a 2018 Conference Sponsor?!!! After electing your sponsorship level, please contact Jen Oden at jen.oden@snoco.org. Basic level package which includes company logo with link from registration and conference webpage, company name and logo printed in conference program, reserved vendor 10’x10’ display space at conference. Conference registration for one person included. Mid-level package which includes Bronze level benefits plus story page advertising space in four editions of WALPA’s quarterly newsletter “Waterline” with distribution to 350 individuals and lake associations and reserved company banner display space near main podium. Premium sponsor package includes Silver level benefits plus premier main page ad space in four editions of WALPA’s quarterly newsletter “Waterline” with distribution to 350 individuals and lake associations, inclusion of company bio/article in one “Waterline” edition and inclusion of company promotional items in the conference registration packet. Nominations for the 2018 Secchi Disk Award! The WALPA Board is seeking nominations for the annual Secchi Disk Award to be presented at this fall’s conference in Portland, OR. Each year WALPA recognizes an individual who has made an outstanding contribution to the science of lake management and protection. Let us know about a lake hero who should be honored with this year’s Secchi Disk Award. The Award is open to any individual contributing to lake science, protection, or management in Washington or Idaho. Recipients of the Secchi Disk Award must be current WALPA members, and current WALPA Board members are not eligible to receive the award. Your name, mailing address, telephone number, and email. Full name of the nominee, present position, organization or affiliation, mailing address, telephone number, and email. A 200-500 word description of the nominee’s work and accomplishments. Nominations should be submitted by email to jimgawel@uw.edu and must be received by September 1st. Send yours today!